Kindergarten is a fun and exciting year. If you’ve never taught kindergarten before or if you’d like to learn some new tips and tricks, keep reading! Kindergarten is a wonderful age of learning, exploring, and enormous growth. Just like any other grade, kindergarten has its challenges. A few years ago, I was unexpectedly transferred to kindergarten. I was so nervous and I had no idea what to expect. The only experience I had in teaching was in the upper grades. I thought kindergarten was scary. How in the world do you keep 25, five your olds busy all day, let alone engaged?! 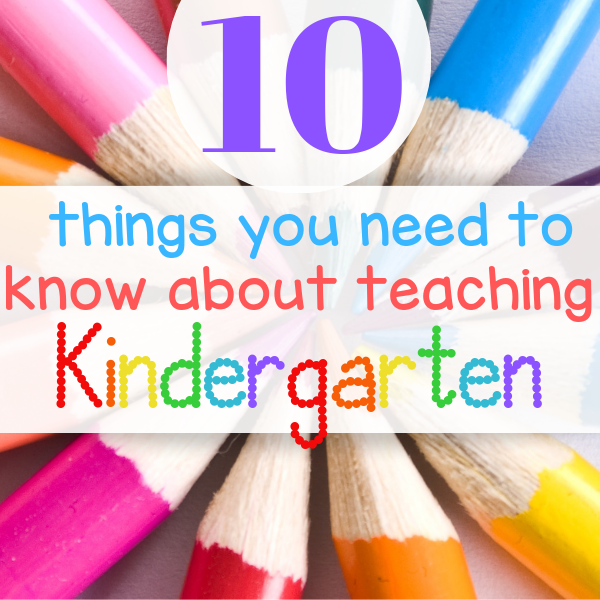 I want to share with you the ten things that I wish I had known when I started teaching kindergarten. Ok, I know this sounds like overkill, but trust me, you’ll thank me later. Most kindergarteners have never been in a school setting. Some of them might have gone to preschool, but the structure of kindergarten is much different. 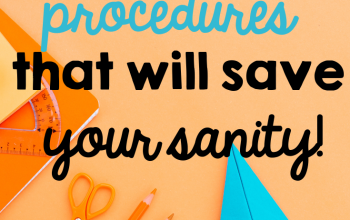 Have every procedure you can think of thought out exactly the way you would like your students to do it. You might get lucky and have a few students who have older siblings and know how to “do school”, but for the most part, you’ll need to teach them everything, like how to color in the lines, how to use scissors correctly, how to use a pencil, how to properly use a glue stick. The list goes on. Here is a great, free list of classroom procedures and routines. Our specials (music, PE, Computers, Art) differ from day to day, but the students eventually pick up when the specials are. Students know what’s coming next and they can mentally prepare for it. Of course, you have some flexibility, but try to stick to a day to day schedule. In kindergarten, we don’t grade papers, but we do a lot of assessments. I have a 4″ binder with a tab for each student and their assessments for the year. You need to have a system for all those assessments and other forms of student data, like observations and standardized tests. You should also think about how you’ll organize guided reading groups, centers, and other resources. This is a big one. You must have at least two strong behavior management systems in place. I say two because you should have one to fall back on. Not all students are going to respond positively to the same incentives. In my classroom, I use Class Dojo. I love this tool, my parents love this tool, and most importantly, my students love this tool. Students can earn points for following classroom rules, being kind to others, or whatever else you want to add. You can also take points away, which is optional. My favorite part about this tool is that you can communicate with parents directly. This is by far my strongest tool for communicating with parents. Best part, it’s free! I also use a team point system. Table teams can earn points when they are working cooperatively. Winning teams get a prize at the end of the week. Kindergarteners are a special group. They’re still at an age where they aren’t embarrassed by their parents and miss them all day long (most of them). As teachers, we are in loco parentis, in the place of a parent. It’s important for us to show our students how much we love and care about them. We also want our students to love and care for each other. When we build a community in our classroom, students are more willing to participate in discussions and share their thoughts and ideas. In my classroom, we do a morning meeting. There are four parts to a morning meeting. The Responsive Classroom has tons of wonderful ideas for morning meetings. Find out what your state standards are and study them. Your standards will tell you exactly what you should be teaching and what your students are expected to know when they leave your classroom. The better you know your standards, the easier it’ll be to filter through lessons. When you know your standards, you’ll be able to plan better. Just like kindergarteners are nervous to leave their parents, their parents are nervous to leave them. As a parent of a kindergartener, I know how hard it is to leave your 5-year-old all day, even though I’m right down the hall from her. : ) Send notes home, make phone calls, send emails, or use Class Dojo. However you do it, let them know you’re available and you care about their child. I use Class Dojo every day in my classroom. I post videos or pictures to show parents what we are doing. Don’t stop your lesson and take a group selfie, but if you’re teaching something fun, send parents a quick note about what’s going on in your classroom. They will totally appreciate it. It’s important to remind yourself that kindergarteners are only five or six years old. They’re babies. It will take time for them to learn all of your procedures and routines. Don’t get frustrated, just keep practicing. Kindergarteners don’t need a lot of worksheets, they learn through using their hands. Incorporate hands-on learning as often as you can. #10 – Sing songs and have fun! Kindergarteners love songs! You will capture their attention and they’ll be engaged. Makeup songs. Seriously, you can make up a song for anything and they’ll love it. If you’re not much of a singer, don’t worry, you can use songs from Youtube or Go Noodle! My students love the brain breaks on Go Noodle. Kindergarteners have an attention span of about 15 minutes, so it’s important to incorporate a lot of brain breaks. And most importantly, have fun! 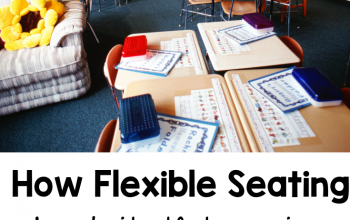 Kindergarten is an exciting year and your students will make enormous growth. 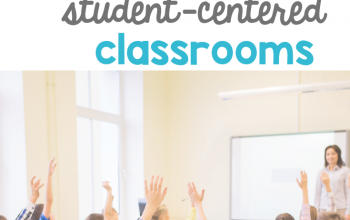 For more tips on classroom management, see my post on How to Regain Control of your Classroom. It’s always nice to know what it entails because I know it can’t be easy dealing with lots of kids but if organised then everything becomes easier. I had no idea that there were so many things a kindergarten teacher should do. From my days in kindergarten I remember that we used to play a lot but we also did educative things, such as learn words in English. I don’t know that I could be a teacher. You guys really deserve so much! Thank you for all you do! I always appreciate kindergarten teachers who know how to deal with kids. I just call them God-sent since not everyone can be as patient. And certainly, it does have a lot of activities. Great tips, not only for a teacher but for anyone who has children. Routines are so important! I believe you listed some of the most important tips for new/veteran teachers specifically in elementary school and kindergarten age children. I think some teachers forget to be patient with their students, realize that everyone learns at different paces and different ways. In casework there were many cases I was assigned where teachers were “fed up” with a child’s behavior and assumed they were ADHD. It was extremely irritating and repetitive. Thanks to this post now I appreciate the work of kindergarten teacher even more. Big thanks for what you are doing for the kids today! This is an interesting read, my Mum was a nursery nurse so I always heard her stories of what it was like over the years. Fun, I was an elementary or teacher for 8 years and I loved my time with the kindergarten. Although 50 minutes was the just right amount of time. I don’t teach Kindergarten, but I do teach dance to this age group. Having a schedule and sticking to it has been THE BEST thing I have done. On the days when I “switch things up” I lose all control, so I’ve learned that sticking to the same schedule and just adding in new exercises is the best thing for these kiddos. I love these steps. Because, for one, these steps will cultivate a child tobecome a well-molded person as he or she grows up. Having a set of schedule, having the ability to be disciplined in all tasks, knowing what is right or wrong, and being able to cope with life’s challenges, having a time of merry singing and whatnot. Thanks for sharing this! Wow, I never realized how much a kindergarten teacher has to do. My niece is a kindergarten teacher and she absolutely loves working with this age group. My sister-in-law is a kindergarten teacher. Love to share this with her and I’m sure she’ll love these. Having a plan when you are working in a classroom is such a big deal. The more you are prepared the better off you are. Although being flexible in order to deal with whatever comes your way is important too. if i’d be a teacher, my biggest concerns would be behavior and organization! it is always delicate to reprimand somebody else’s kid. I was not aware kindergarten teachers had so much on their plate! This is quite interesting and just in time to share to my colleagues who have toddlers that are soon be on their kindergarten years. Definitely this would be a big help to them.